Follow @MLB on Twitter and go behind the scenes here! You can also follow the official list at @MLB/players. Tweet @MLB to verify any other potential player accounts. We only list players who (a) tell us it’s them and (b) are fine with being listed. For the full list of active player MLBlogs, click here and then use the PRO BLOGS dropdown menu and see the list. And be sure to blog along with MLB personalities! That is the single ubertag that 100s of MLB Tweeps including @MLB will be using now through the @WorldSeries parade. The Postseason is synomous with Baseball. Tweet @MLB if you have pics or videos of live Major League Baseball on your new iPad! Again, not even close to scientific — Central time zone could have been on lunch and away from computer. But with 12 days to go before Opening Day, one busy afternoon at the MLB offices, this is how the tweets came in and take that for what it’s worth. As we’ve said, we created this blog for those times when 140 characters just aren’t enough. For those of you wondering how this blog dovetails with the @MLB Twitter account, @fastbreakdgtl tweets about a very interesting piece on that very subject. THANKS to all of our fans on Twitter!!! Just created this blog on MLB.com/blogs because sometimes 140 characters is just not enough. This blog will be used frequently to support our main @MLB account on Twitter. For example, what you see already here: The ONLY official/verified list of MLB players on Twitter; updates on all of our 200+ MLB Tweeps; super followers; the occasional Jack Nicholson shot because you are allowed to freely use AP/Getty images under the umbrella of MLB.com/blogs; the Twitter Giveaway legal rules; and whatever else becomes necessary. It has been a fast summer of growing on Twitter. Major League Baseball is believed to be the largest single entity on Twitter in terms of multiple accounts; Marvel had about 80. We should be around 300 shortly. According to our contact within Twitter’s corporate offices, we have by far more accounts than any other single entity globally, so go by cumulative follower #s if you’re counting for MLB vs. anyone else. Go to MLB.com/connect and click your favorite team’s logo, and you can see how to connect with your favorite team in many ways. Be sure to join your team’s official Facebook page there, or the MLB official Facebook page. We now have the official MLB Club site’s URL name as the Twitter account name in almost every case, with some rare exceptions. Those are in some cases works in progress, and if you go to that Connect page and follow your Twitters, then you will see everything continue to grow in this important aspect of baseball life. Keep following and keep sending us tweets, and keep spreading the word so we can hit a million! We’ll keep delivering contests and hopefully some tweets worth seeing. We tend to tweet a lot, so keep that in mind if you have our tweets on a mobile device. These are the big leagues and there is big news all the time! 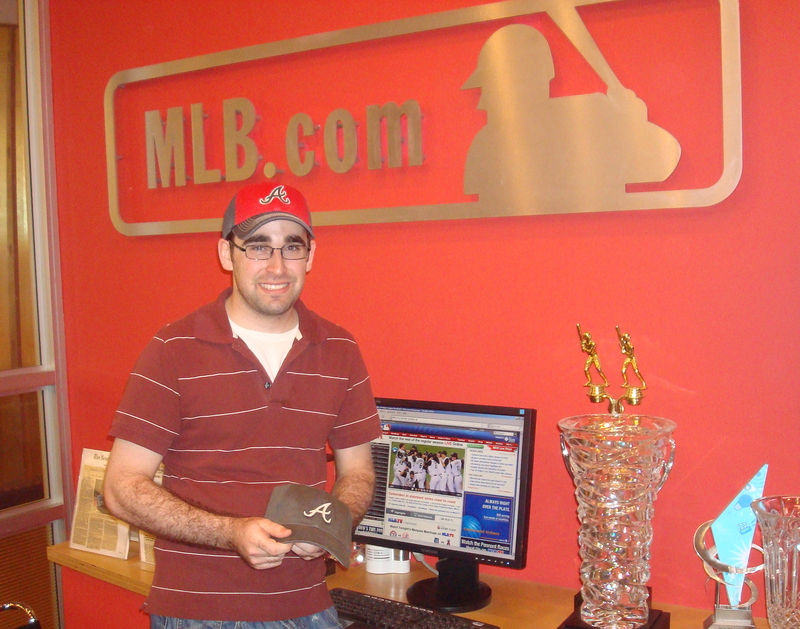 In case you missed it, we posted this twitpic of lucky 300,000th follower @AndrewGMarks this past week on the @MLB Twitter. He just happened to live in the same general area as our MLB.com HQ in Manhattan, so we invited him on up and gave him a couple of Braves caps, talked some baseball, gave him the nickel tour of our historic building, took the twitpic in our lobby, and then sent him to the showers. He’s a good guy so follow him and say hi. Already well on our way to No. 400,000. 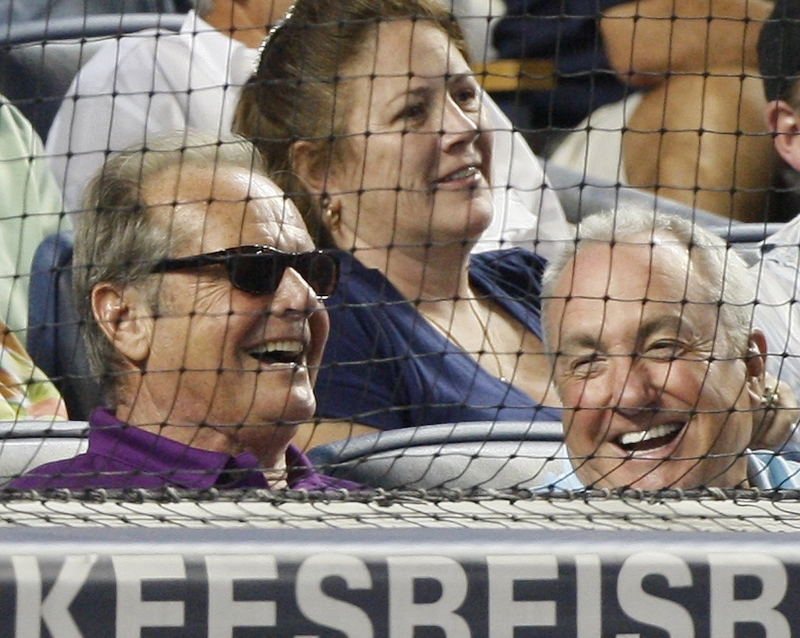 Jack Nicholson with Lorne Michaels at tonight’s Yankees home game vs. Rangers. AP Photo just moved this, meaning you’re too late if you were going to post a twitpic of Jack for @MLB and win the free Yankees cap offer. And congrats to @amandarykoff for winning the Yankees cap from the MLB.com Shop because she posted a twitpic from the scene of Paul McCartney being recognized on the giant scoreboard there as Yankees Fan of the Game during the seventh inning. That’ll work! Congrats, Amanda! You beat all the pro photogs tonight!!! Sorry to hit you with the legalese, but you’re too big a crowd and we’re under orders. will determine giveaway recipients in its sole and absolute discretion. local laws, rules or regulations.